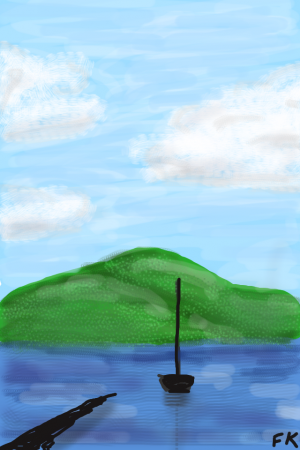 I have been looking at the Brushes iPhone app on and off since I got my iPhone more than a year ago. I’d seen some incredible images created with it, and I wanted to try it out, but it was pretty pricey for an app at $4.99, and I wasn’t sure if I’d really use it. But just before my flight to Florida on Wednesday, I decided I would treat myself to a little present, since I knew I’d have some free time in Florida. I played around with it a bit on the plane, but found it awkward — I kept making the strokes too thick, or making strokes when I meant to be moving the canvas around. I also didn’t have a clear plan for what I wanted to create on it or how I was going to go about it. Last night, though, I decided to give digital finger painting another try. I started with a simple image close to things I’d painted in the past. A lake landscape with a sailboat. Then I decided I’d move on to something more complex. I’d had so much fun creating my Conan-Leno Illustrator piece, I thought I should try out another portrait, though this time it would be more freehand. I chose a photo of my sister Michelle that I took on my iPhone a few months ago and got to work. I outlined the image, colored it in and added some shadows and highlights. 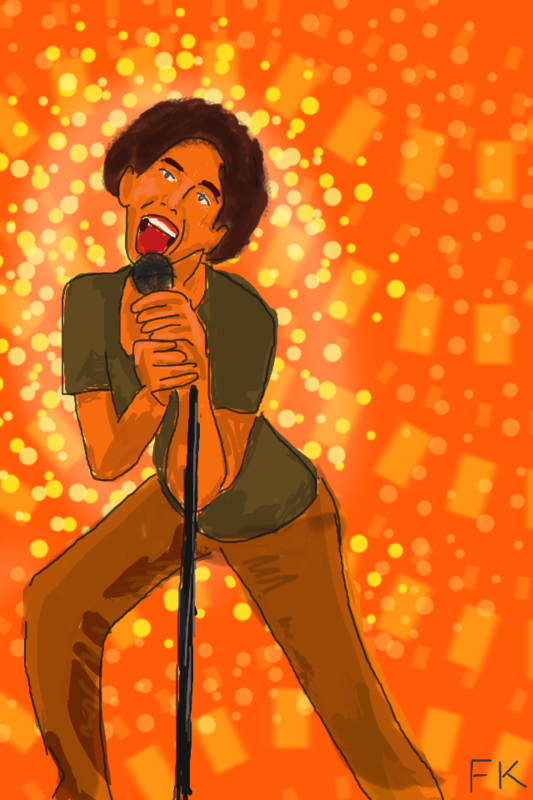 Then I added a fun background that went with her hilarious karaoke posing. Then I found out that Brushes lets you play back your brushstrokes from your .brushes file, and I created this little movie of creating the image. It’s a little strange in that it doesn’t actually go 100% chronologically, but starts with the back-most layer, and fills in your brush strokes in order for each layer. It’s actually quite backwards from how I created the image. Still, it’s quite cool. And my grandma has already asked that I create a portrait of her. Creating a Brushes Portrait of my Sister from Francine Kizner on Vimeo.